Yes, the new Pope is Southern. Well, not Alabama southern, but he is from "South" America. 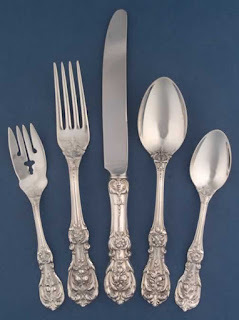 And lest we question this fact, he chose to be known as Francis I after every Southern belle's favorite silver pattern. Bless his heart! Though raised at a time when middle class young women picked out their silver patterns, over-embellishment was anathema to me. I chose Gorham's Classic. More than 50 years later I still love the gleam of it's clean lines. And so much easier to polish! Wise choice. Though Pope Gotham? And I still love Francis I and its marvelous fruit. I wish I had selected this as my pattern, but I was told by my mother that I should pick her pattern, Chantilly. Boy, did she con me or what! My mother's pattern was Chantilly, too. I use some of the serving pieces along with the Classique. Who's to say it doesn't "go". It's all been well-used and loved and holds many memories. Mr. J.W. 's mother pattern was Chantilly. I grew up without silver. Last year, however, I fell in love with a set of vintage silver plate Fleur de Luce and am very happily making up for lost time. Enjoying this blog no end. Found you ages ago and linked when seeking Mitford photos. Then re-found you just now when linking to that post. Just finished re-reading The Help where it mentions Chantilly and Francis, funny that. My Grandmother had Spring Glory and though I didn't manage to get her silver, I later bought some for myself.